A simple way to make extra money is to sell used books online. If you are an avid reader like I am, you’ve probably accumulated quite a bit of books. And let’s be honest, many of those books are never going to be opened again. They are just going to gather dust in the attic, in the garage, or if they are lucky on the bookshelves. No, I don’t mean burning your old books, or trowing them away. I mean selling them for some extra cash. You probably are surprised as most people would be, since the majority of people wouldn’t have a clue how or where to sell their used books. Thankfully, there is an easy way to turn those used books into cold hard cash. No, you are not going to be selling on eBay or Amazon. You don’t have to list your books anywhere and hope someones is going to bid on or buy them. There is a much easier way to cash in your unused books. A website/service based on a simple yet brilliant idea. They buy used books directly from book owners. Simply visit Cash4Books.net. Right in the middle of the site, there is a form. 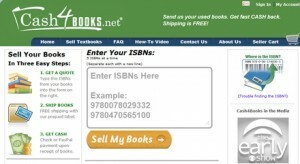 Simply type in the ISBN’s number of your books and click “price my books”. Enter your contact information on the second page and choose who you want to be paid for your books (PayPal-check). Print a shipping label from your computer or you can ask them to mail you shipping labels. Then ship your books to the address provided. You will get paid in as little as 3 business days after they receive your books. It is as simple as that! You can take this a step farther. Contact your friends and family and ask them if they have any old used books they want to get rid of. Use classified site like Craigslist to find free used books. You could either post an ad on Craigslist, letting people know you will pick up used books for free or simply look in the “free items” section for free used books. Another way to gather even more used books is by going to Thrift stores or checking out Garage Sales. Often books are sold in thrift stores or garage sales for pennies. How to know if a book is worth it? If you are not sure about the worthiness of the book you are looking at, simply use your cellphone to get on Cash4Books.net and enter the ISBN’s number of the book and use the ‘price my books’ feature to find out if that book is worth your while. It really can’t get any easier than that. The good thing is that there is no fee for selling your books. You get to keep every penny of what you earned from selling your books.